SEATTLE, WASHINGTON - January 2, 2018 - Vitamin Packs, the next generation personalized vitamin subscription service, today unveiled two new products - its Foundational Multi-Vitamin™ and Pre-Post Natal Multi-Vitamin™. These multi-vitamins will join the company's personalized vitamin packs to deliver the right mix of high-quality nutrients at therapeutic levels, fueling the body for overall wellness. Vitamin Packs' new multi-vitamins are available after completing a personalized nutritional assessment. Based on answers to the nutritional assessment, Vitamin Packs curates a custom combination of vitamins and nutritional supplements that meet an individual's unique needs. © Copyright 2018 Vitamin Packs inc.
"Our new multi-vitamin and pre-post natal multi-vitamins are truly the best that can be developed for absorption, effectiveness, quality and safety," commented Jason Brown, co-founder and CEO of Vitamin Packs, Inc. "Through our medical advisory board and the latest nutrition research, we identified what the body craves to help it run better - especially at times when we can't eat perfectly. Whether you are a pregnant or nursing mother, or an adult looking for therapeutic levels of nutritional support, Vitamin Packs combines best-in-quality ingredients to create a unique recommendation made for your body's needs." "A healthy pregnancy starts before conception, and research shows that taking a prenatal three months prior to pregnancy and through pregnancy may help decrease the chances of birth defects and childhood cancers. I recommend that women who are planning to become pregnant begin a prenatal supplement routine right away," said Michael Roizen, M.D., Chief Wellness Officer at the Cleveland Clinic, and Vitamin Packs Medical Advisory Board member. "In fact, since 50 percent of pregnancies are unplanned, the best advice might be for all women with pregnancy potential to begin a prenatal multi-vitamin. Prenatal vitamins are designed to help mothers and their offspring be as healthy as possible. A prenatal multi-vitamin before and during pregnancy gives just what a new mother needs - peace of mind - as they grow and care for their little one." 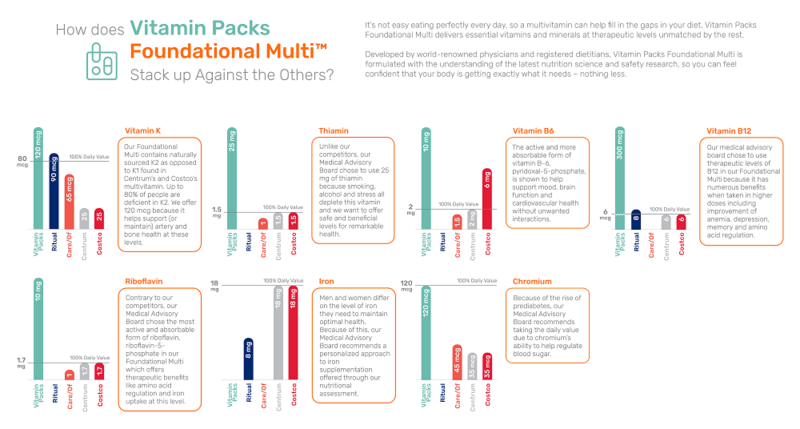 Vitamin Packs' rule-based Natural Intelligence™ analyzes a large and growing body of nutrition and lifestyle research collected from more than 10,000 peer-reviewed journal articles and the wisdom of Vitamin Packs' advisory board of medical professionals that includes experience with more than 100,000 patient visits. Vitamin Packs' Natural Intelligence cross-examines 650 drug and nutrient interactions to deliver only what the body needs. Vitamin Packs, the next generation vitamin subscription service, helps consumers take the guesswork out of the dietary supplement aisle by using Natural Intelligence™ to deliver personalized nutrition safely and conveniently. Vitamin Packs uses thousands of personalized inputs to recommend supplements that meet individual needs and lifestyle habits. As a proud supporter of Vitamin AngelsÂ®, every Vitamin Packs order provides two children who are malnourished a full year of vitamins. 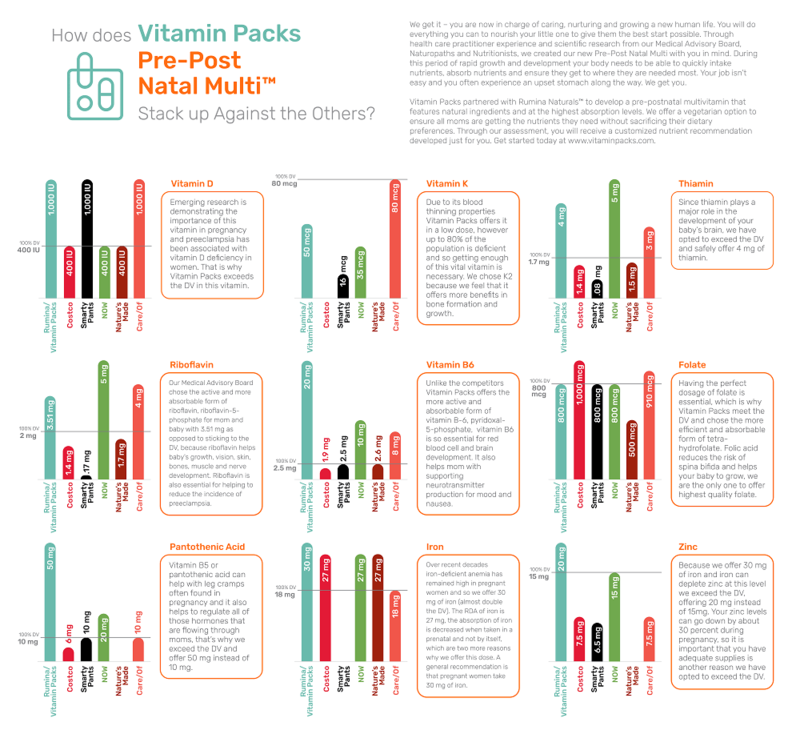 To learn more about Vitamin Packs, please visit www.vitaminpacks.com.